A few weeks before I was due to leave for South America, a friend shared a video on Facebook. It wasn’t a snowboarding dog, or an anonymous Canadian teenager doing an amazing rendition of Taylor Swift. It was the videophone-shot footage of a passenger bus negotiating a narrow gravel road, several kilometres up the side of a sheer cliff face. Half the passengers had disembarked the bus, were crowding around the side and yelling instructions to the bus driver. The driver gave the giant rust bucket a gentle kick as the front left-wheels passed by a dip in the road caused by the recent rain. The bus continued to balance precariously along the spindly road, before the ballsy driver finally gave it one spurt of acceleration too much, and the wheels slid sideways – taking the bus, the driver and the remaining passengers to the bottom of the cliff. It wasn’t a remarkable sight, the video didn’t even have that many views. I’m not even sure it made the news. Guess that’s what people come to expect from Death Road, more commonly known as The World’s Most Dangerous Road, but actually known as Yungas Road, La Paz, Bolivia. So what better way to see where the bus went wrong than sign up for a full day tour biking down the same route that had killed so many before it? The same way as how you book most of your tours in South America, wander through a few tourist operators and play them off against each other. The best place to do this is La Paz, where there are hundreds of outlets offering the death road tours, and touts trying to sell them to you in the middle of the streets. All the prices are somewhat the same, but you will find outliers who offer the tour for much cheaper. In a note much unlike me, I must warn you to steer clear of the really cheap ones. The money you spend here corresponds to how high the likelihood of you getting seriously hurt is. If you’re going to scrimp – be prepared to have a crappy bike and a guide with little regards to your safety. The cheaper the tour company, the cheaper the gear, and when you’re hurtling at break-neck speed down a narrow road on the side of a cliff (needless to say, without a singular barrier) you don’t need your brakes giving out at the last moment. Gravity (or Gravity Assisted): The most famous operator, which also means the most expensive. All of the gear and equipment at this tour company is top-range and almost always quite new. 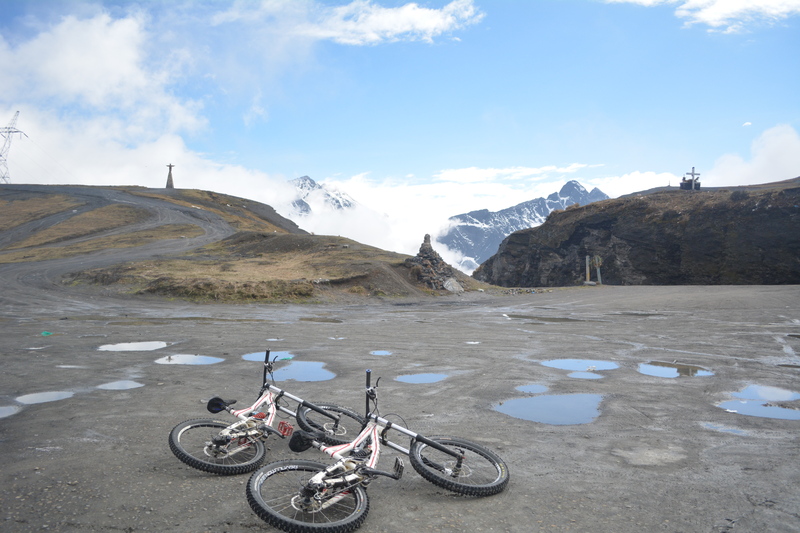 Altitude Biking: Almost as well-known and marginally cheaper than Gravity, this is another higher tier, but incredibly well-versed-in-tourists agency. They’d got us all to the end – and more importantly, to the waiting swimming pool and buffet in the nearby town. Plus, the outfits were cool. 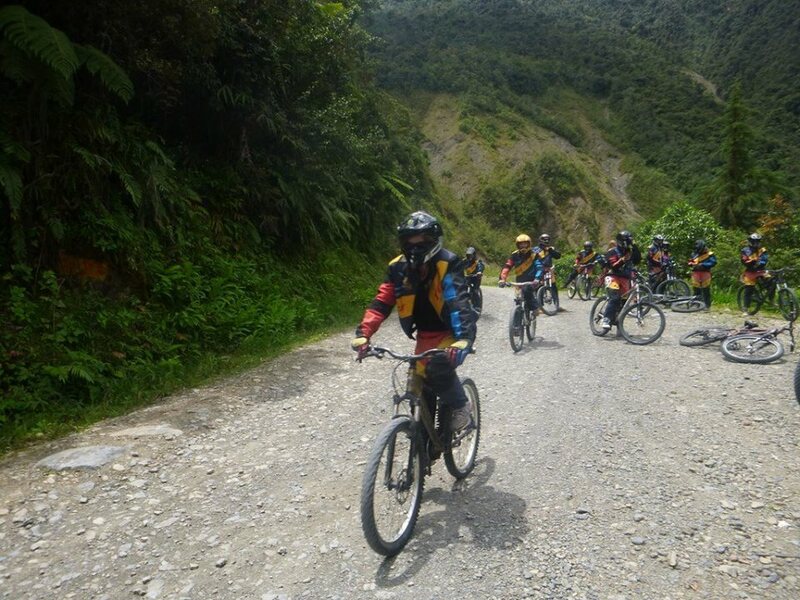 Your tour should include all your food (breakfast, and buffet lunch after the ride), transport from La Paz and sometimes a swim at the hotel afterwards. You should pay roughly around $60/ $70 USD. After leaving La Paz pre-coffee early, with the temperature hovering around the negative double digits, you’ll soon stand on the precipice of one hell of a 4,700m peak, staring below you at the start of the 64km downhill hurtle you’d paid for the privilege to attempt not to permanently maim yourselves on. Now is about the time you’ll hear many a grim tale. You’ll start of with an undulating feeling of cockiness, buzzing calmly down the fully tar-sealed road and wondering what all the fuss was about. This carries on for about 24 kilometres, at about which time you’ll be convinced you’re ready for the Tour de France. Back into the van you’ll head, for an 8km slog uphill to the next part of the road. Because God Forbid we actually had to use our legs on these bikes. Here’s where you’ll actually encounter Death Road. And there’s good reason why it’s not called the Reasonably Narrow and Close To a Cliff But Otherwise Driveable Road. About 500 metres into it, it’s inconceivable this was ever anything other than just a freakish BMX track made for tourists. It beggars belief a small car could ever manoeuvre the two-metres dips of gravel in places, let alone the doomed Youtube bus. Each corner you round, the spindly road will continue to hang precariously to the cliff beside it, but just looking as though it might crumble under the weight of a person walking on top of it – let alone the thousands of tonnes of traffic heading into Bolivia’s largest city. Of course, a new road has since been built to accommodate the majority of the vehicles heading to La Paz, but this road, for some reason, remains widely used. The day of our ride however, it was closed to traffic due to landslides from the recent rain. I wasn’t sure if that made me feel better or worse. But it’s reason enough to keep hurtling at break-neck speed if I ever heard one. You won’t find relief in guard rails or fences, either. More dark reminders of the ethical challenges in taking part in a sport like this will come in the crosses and tributes to people peppered across the roadside. Supposedly, they’re a mix of biking and driving victims. Much the same as the Silver Mines in Potosi, and countless other tourist attractions that make you uneasy about being a tourist, you’ll probably regret paying money to take part is something so sinister about now. Ignoring the ethical challenges for a moment (if you can), it is however, quite thrilling. The notion of not knowing where to look at any given time is unsettling at best, downright terrifying at worst – that guy in front of you who just about went head over handlebars on a corner, the road twisting and turning constantly in front of you, the headspin-inducing scenery which isn’t conducive to concentrating on not riding off a cliff… it all kind of culminates in an out-of-body experience. One where you do indeed know how to handle a bike. And the fact that I had a severely itchy nose for a good portion of some of the really tricky downhill stuff really didn’t help make any of those things work at once. For the most part though, it’s easy to play it reasonably safe. Your mother’s words still ringing in your ears (You will NOT bike down that bloody road, or something like that), you’ll likely leave the racing to the more foolhardy (or completely farking stupid) of the group – and sit somewhere between “comfortably hurtling” and “speeding quite safely” down the hills. Only once or twice will you throw caution to the wind a little and give in to your cockiness, when the universe may politely intervene and throw a rock at your wheel. By the end, you’ll be exhausted (how, from almost exclusive downhill biking and not using anything but a slight bend in the arms, I’m still not sure) and you’ll speed into a nearby town with only a couple of dusty compatriots, who had gotten too ahead of themselves and bit the dust (thankfully, on the road and not over the cliff). It’s probably only at that time you’ll remember a comment from your friend back in New Zealand, who told you about the time her boyfriend did it and a tour guide fell to his death racing his group down the road. But you’ll forget all that rather quickly, because a buffet lunch and swimming pool is waiting. Luckily we had also had the optimistic foresight to move our gear to one of the most notorious party hostels in South America that morning, so the fact we’d survived was well rewarded. And the next day – we were feeling optimistic enough to reattempt the same road on a bus to get ourselves to the Amazon. We were optimistic enough to get on a towering rust bucket, and teeter perilously from the side of a cliff for 20 hours. We were optimistic enough to backtrack on all our previous ‘well,thank god we’re not in a bus’ comments, regarding the aforementioned Youtube video. I will not ever be doing that again.